Most learning technologies rely on vague philosophies similar to the least effective classrooms: didactics followed by a test. Hickory offers a far more sophisticated approach, building on multiple lines of research from learning science. Since the groundbreaking work of the 19th century Hermann Ebbinghaus, psychology has known that people tend to forget information in a steep but consistent curve. 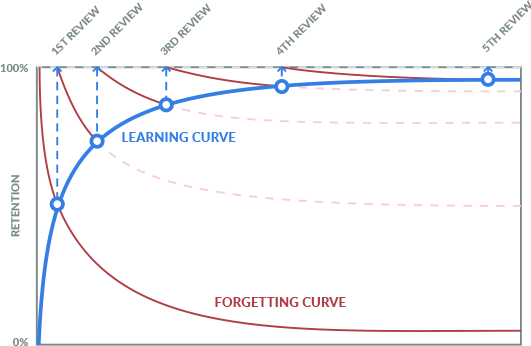 Further research has shown that active recall through testing can be timed to counteract the forgetting curve. Continuous learning and review is at the core of the Hickory Learning Solution. But we go further, with an algorithm that personalizes learning and practices that optimize information recall. In the early 20th century Jean Piaget and Lev Vygotsky both found, independently, that learning is not just adding information to a storehouse of facts. People integrate knowledge into their own systems of thought. In other words, learning is taking new information and finding ways to make it fit with what we already know. The Hickory training system goes beyond exposing information through videos and text. Our algorithm responds to how the matrices of knowledge are developing, not just what isolated facts the learner remembers. The cognitive revolution in psychology in the mid-to-late 20th century led to an understanding of two types of memory: short-term and long-term. Our continuous learning strategy is designed to move information from short-term memory to long-term memory. Once in long-term memory, though, the information must still be accessed. Multiple associations, such as verbal cues, visual cues and mnemonics, make the information more accessible. The Hickory training system links multiple cues to each fact to maximize and facilitate memory access. Decades of research has shown that a key difference between experts and novices is the number of examples on which experts draw. A chess master remembers thousands of board setups and plays more quickly and strategically because of those examples. Surprisingly, novices rely more on abstract rules. Therefore, the Hickory training system emphasizes memorable examples and ways to apply the newly acquired knowledge. The Hickory algorithm is based on five years of research and testing. When you work with Hickory you are not just buying a learning platform off the shelf. We work with you to ensure our solution optimizes your training. Our mission is to provide you the best training solution.